Made of durable, flexible plastic mesh. Prevent leaves and debris from clogging gutters and downspouts. Features a unique, self-cleaning design. Slip into drainpipe opening to prevent clogging. Unrolls automatically when it rains. It has a unique scoop and drain feature. 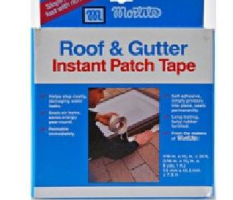 Adheres instantly, seals and repairs almost any surface.